Wealth is created first and foremost in our minds - through goals, beliefs, and a strong sense of self worth. It sounds simple, but many people never learn the basic tools of visualizing success, believing they deserve it and working towards this goal with the belief they will succeed. 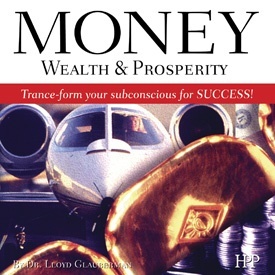 Money, Wealth & Prosperity utilizes Dr. Lloyd Glauberman�s revolutionary HPP method to program your unconscious mind to make the positive lifestyle changes necessary for success. This method allows you to bypass self-sabotage, insecurity, and procrastination while providing you with more positive and appropriate attitudes about success. You will find yourself able to stay motivated and disciplined while developing the basis for financial success... a more positive self-image. I have tremendous amount of gratitude for the magical tapes Dr. Glauberman created. The wisdom he shares is effervescent enough to plant positive seeds in the subconscious mind. The lightness of being I have experienced since listening to the tapes has inspired me to tune into the energy of my heart and creativity of my mind. I am excited embrace the wealth of the universe and share the fruits of my success. I bought this title from Nightingale-Conant, and I loved this MP3. I would suggest the Hypno-Peripheral Processing experience for anyone in a rut, you wake up out of the rut or the boredom. Great stuff, Dr. Glauberman. I cannot say enough positive about this product. I love it in many ways and plan to continue using it consistently. It is very healing also. Highly highly recommended. If you are even thinking about getting it, do yourself a favor, and do so.